The Mareblue Beach Resort is a gorgeous 4-star beach resort in Corfu. The main building has recently undergone refurbishment. This family-friendly hotel is the ideal location for all holidaymakers, whether you want to spend your days lounging on the sandy beach, take in the beautiful views on a walk or relax by the pool. There is an abundance of activities for the kids to take part in, so it really is a place for the whole family. 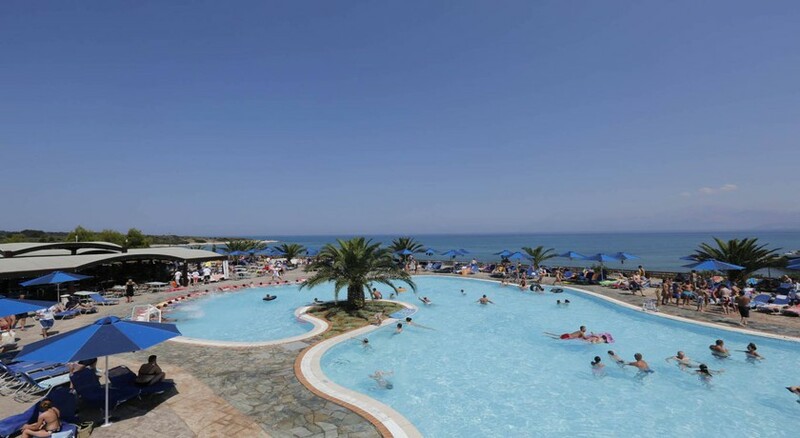 The Mareblue Beach Resort has plenty of eye-catching scenery such as the high peaks of North Corfu, and, in the other direction, there is the Ionian Sea. There are swimming pools including a children’s pool and an adult only pool for those seeking some peace and quiet while they swim! There are many sports facilities available too, such as the gym, tennis courts, football activities and more. In addition to this there is a wealth of nightlife to discover in the surrounding resort. The location of this hotel is ideal, not only is the Mareblue Beach Resort perched on the breathtaking island of Corfu, but the oldest village on the island - Old Perithia - is close by as well, 21.5km from the city centre. Guests can soak up the sights while embarking on some amazing walks around the Lake Antinioti or, if you can’t get enough of the Ionian Sea, then you can take a stroll along the coastal paths. The closest airport is under an hour’s drive so it’s easy to reach. There is a variety of rooms to choose from at the Mareblue Baech Resort. These include a Classic Double Room, Family Rooms with Bunk Beds, Suites and Superior Deluxe Double Rooms. Every room has its own unique view of the Ionian Sea or the vibrant lawns of the hotel. They also boast a modern interior and are equipped with facilities such as hair dryers, Wi-Fi (charges may apply) and a laundry service. There is an in-house Mini Market as well as an in-house doctor if required. There are multiple restaurants and bars that guests can visit during their stay. The Almyra Restaurant is the hotel’s main buffet style restaurant, open for breakfast, lunch and dinner. The Olives A La Carte Restaurant overlooks the St Spyridon bay (a romantic location featuring a three-course menu perfect for couples or a last night meal), The Greek Barbeque Corner serves up traditional Greek cuisine, plus there is The Pool Snack Restaurant for daily refreshments. There is also the Main Lobby Bar which shows live sports events on a big screen, so guests can watch their team play whilst on holiday. There is an abundance of sports and activities that guests can enjoy at Mareblue Beach Resort, meaning they don’t have to leave the resort if they don’t wish to. Dive into the action with 5 a-side football, tennis courts, aqua aerobics, water polo, electronic games, an indoor gym and so much more. There is something for everyone. There is free parking available that is in a secured parking area. There is a shuttle service and facilities for disabled guests. Car hire is available as well. My partner and I booked the Mareblue Hotel as a cheap get away destination at the end of the season in mid October. Whilst the transfer to and from the hotel was a little uneasy due to the sheer cliff drop to one side of us, the hotel and entertainment were above our expectations. The layout, cleanliness, staff, entertainment and surrounding facilities were all fantastic and suited for all. Whether you are a young couple, a family, or on your own, there is something for everyone. We've already planned to rebook end of season again and take another couple with us for a friend's holiday. If they were to improve, I would suggest a wider selection of alcoholic drinks, but they were free... Otherwise, Mareblue is definitely on the cards for us to return to. PS - the food is phanominal!!!! Had a fab family holiday, kids loved it even though the pool was like ice!! But food and hotel was amazing, would definatly recommend. Weather was nice, lovely pools, staffs were good with us. Didnot have any problem staying there. Wish in an all inclusive holiday, drinking water is free but bar refused to fill the water bottles. We ended up buying water from the nearby shop for the room for evening and nights. Visited this hotel for my birthday in April and had a fantastic time. I was a bit concerned about the transfer time from the airport but it was well worth it. There is a daily shuttle bus that allows you to plan trips and it is reasonably priced. Hotel staff were fantastic cannot fault them at all. First time to Corfu and will definately be visiting this hotel again. The spa was absolutely brilliant and well worth it. This only being my second time abroad was really special. The hotel is great we went all inclusive so never had to go hungry or thirsty! Our room was bigger than expected with air con and comfy beds. Planning on booking again soon for next year! Beautiful hotel, very accomodating staff. Great food choice. Views are stunning. Enough loungers and pools for all.